Patch My PC Updater is a free program for Microsoft Windows PCs to run update checks on all installed software programs. We reviewed the program back in 2011 for the first time, and the release of version 4.0 was incentive enough to publish a new review. As is the case with update-related programs, it is limited by the supported software programs that it has in its database. You can, however, download and install updates that are available using Patch My PC Updater. You can run Patch My PC Updater directly after the download as it does not need to be installed. The program requires an active Internet connection, however. Patch My PC Updater scans the installed programs on the PC it is run on when you start it. It supports more than 300 different programs in the latest version with new programs added regularly to the database. Programs are sorted into groups such as Media Tools, Browsers, or Plugins & Runtimes. Applications that are out of date are highlighted in red. The application lists the total number of detected applications and the number of applications with updates in its interface. First-time users may want to open the program options on the first run to customize the program's functionality. It may be a good idea, for example, to enable the creation of a system restore point before updates. Other options worth exploring are to enable a download-only mode, disable the silent installation of applications, or to enable verbose logging. All outdated programs are selected by default. Patch My PC Updater 4.0 lacks options to start with a clean slate (remove all checkboxes) or filter the application listing. Updates happen silently in the background by default. This is comfortable as you don't need to have to interact with program installers this way. The downside to this is that you have less control over the process. If you want full control, uncheck the silent installation option the program settings. The new version of Patch My PC Updater comes with a right-click context menu that you may use to enable or disable the automatic updating of applications, remove a program, add and remove from auto-installation, and to open the developer website. The latter is especially useful for research, as you may want to check Patch My PC Updater's findings before you hit the install button in the software. One interesting feature of the program is that you can schedule updates so that checks and the updates happen automatically. While that may not be for anyone, as you lose quite a bit of control when you let a program do all the updating automatically, some users may find it helpful keeping their systems up to date with minimal effort. You may have programs that you don't want to update. This can be a commercial program that you purchased a license for that would expire if you upgrade or a program for which the developer published an interface redesign in a newer version. Patch My PC Updater takes that into account and lets you block programs from being updated. Programs that are not installed on a PC may be installed as well. Just check the entry and click on the update button to install the application on the Windows machine. Patch My PC Updater includes additional nice-to-have features. It suppresses reboots, and may also install 32-bit versions of programs on 64-bit versions of Windows. 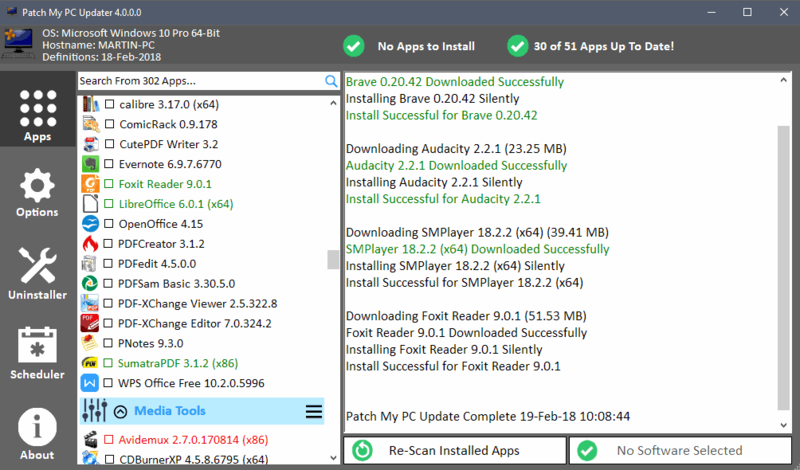 Patch My PC Updater 4.0 is a well-designed program for Windows to help keep the software on a Windows machine up to date. It comes with the right customization and automation options, as it allows you to block updates or schedule updates so that they run automatically. The program would benefit from a few options that increase usability. An option to unselect all items, to display only programs with updates or options to display the release notes of programs with updates would be useful in my opinion. Now You: How do you keep track of program updates? I use SUMo from KC Softwares. SUMo allows addition, removal or ignore for any app on the PC. I’ve been using it for about two years. The current version is 5.5.4.385. PatchMyPC is perferct for my needs, it has a big list of apps both installable and portable and plenty configurations, another big plus for me is that it has the ability to autoupdate on itself when you run it if there’s available a new version. I’ve been using Chocolatey Package Manager for a few years, and love it. It is free, and there is a paid version, but I haven’t checked that out yet. This is a CLI utility, that similar to linux let’s you install/uninstall/upgrade applications for windows. I also have been using Sumo for many years now. I have downloaded and will test for differences. I also use the Portable Sumo for updating friends and family”s PCs. I’ve tried “Chocolatey” , “Scoop” and “Sumo” and so far I’m left with Sumo , because it only checks for existing software. Sumo does not have it’s own software repository to allow new software installation. I want to mention that with Chocolatey and Scoop I ran into basic usage issues like software did not uninstall on request , or it would appear back in my list , although I seemingly uninstalled it successfully . I used some times this software, but it always install the english version of the software (even on PCs with non-english Windows installed). I don’t know if this can be customizable or it’s a “feature”. There’s an option to install apps in different languages in the options menu. There’s only a handful of applications that are enabled for this option you can click the text label to get a popup of apps that support installing in a custom language. If there are additional apps that have language specific installers, just let us know. Glary has a software update checker function also, and I use both Glary and PatchMyPC. Sometimes one of these will catch an update the other did not see. Between the 2, I am pleased. Glary does not perform the update, but opens the website FilePuma from which you download the installer for the latest version and do a manual update. Notably, both fail to notice when Macrium Reflect needs updating, but this is no problem as Macrium always updates itself automatically when you open it. I have seen the other softwares in the comments, but as I am well pleased and don’t see any good reason not to leave well enough alone. …. well, these types of update programs certainly can be useful — depending upon a user’s needs. However, the standard caution applies — you are permitting some remote entity to scan your entire computer/files and make whatever changes it desires to your computer. Yes, much trust is initially required for the manufacturers of your basic computer software/hardware — but how does one evaluate the trustworthiness of any 3rd Party software ? I’ll give Patch My PC a try. A swift search about Yelp or BBB and you’ll see they are scumbag’s. Nobody in their right mind actually things they are credible. I don’t want to hurt your feelings, no offense. Thanks for the review Martin! FYI: you can disable the auto section of outdated apps by checking the option “Disable Auto Updating Of All Apps”: in the options menu. Just wanted to let you know in case that’s what you were referring to here “All outdated programs are selected by default. Patch My PC Updater 4.0 lacks options to start with a clean slate (remove all checkboxes) or filter the application listing.”. When enabled, Patch My PC won’t auto check outdated apps on start. Of-course if you only want to exclude auto checking/updating of a few apps you could enable the skip option on the apps context menu. PatchMyPC has no facility to specify additional paths to scan for installed programs, for example, if portable programs are installed at a different location they will not be included. SUMo does provide this ability. Opera 64 bit version is installed. PatchMyPC indicates Opera as 32 bit version. How about a comparison to SUMO, FileHippo and other similar products? Through the years i have learned that the latest drivers/softwares aren’t always the best… I always stay with the most stable version, no matter what new feautures are included in a newer version. Too many software manufacturers include too much bloat and bundle them with spyware/adware today. I joined Patch My PC team several years ago because I was looking for a program to help my customers easily update their Adobe and Java programs, the out-dated programs which virus / malware writers and hackers were targeting. Many programs need to be updated or patched to secure against vulnerabilities. Thank you, testing it out now and it is a keeper. This is a very nice program. It worked perfectly on my computer. Thank you. Has anyone done a comparison of this to Secunia PSI’s free version? I have used Secunia for some time and it seems to do a decent job of keeping my systems updated. But as Martin pointed out it is all about the database that the application uses to determine if there are upgrades available. We started using PMPC a month or so ago and it works great. We have a scheduled task that runs a scan every weekend. We also use the Cache mode so that it only downloads the installer once and then all the other machines reference it since they run it from a shared drive. I used to love “Secunia PSI”. However, from parent company Flexera Software LLC notification of termination (end) of Secunia PSI “Support & Maintenance will end at 4/20, please remove Remove this application by that time” To research alternatives. Items that can be checked for vulnerability are limited to about 300 major items. “Update” application is simple and extremely simple without requiring troublesome operation. “Option” function is substantial and I am not dissatisfied. From another point of view, “Patch My PC Updater” is superior. Review of this site became a great reference. a great piece of software interface following the ethos of ‘keep it simple stupid’…..